While reading this post, just imagine the giant smile running across my face. This, is pretty cool stuff right here. As many of you know, we’re big fans of JRummy’s CyanogenMod ROMs and his newest release has a special connection to this site. 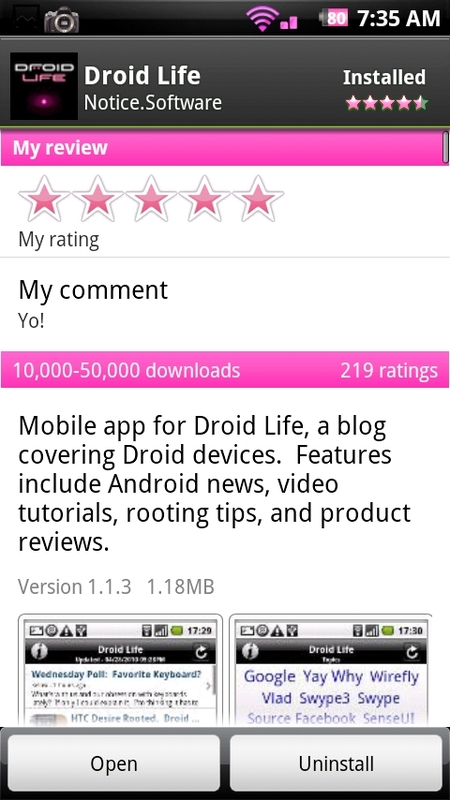 JRummy’s Pink-Life went live on Friday and has some special Droid Life goodies attached to it. Not only did he feature our pink and black color scheme, but he included the DL boot animation plus our black and white live wallpapers that were released a couple of weeks ago. Oh, he also optimized them to work even better with Cyanogen ROMs. This may sound biased, but this might be the best work JRummy has done to date. And to make this install even easier, he included a special Pink-Life Customizer in ROM Manager which will allow you to choose each option along the way. *Note 1* – In brackets are the choices I made to get the full Droid Life experience. 2. Open ROM Manager and select “Download ROM”. 3. Select JRummy and “Rom w/ Pink-Life (Customizer)”. 4. Choose “Rom with Pink-Life”. 9. Choose a font if you wish. 10. Choose extra apps if you wish. 11. Choose apps to delete if you wish. 12. Your custom Pink-Life ROM will now download. 13. When prompted to backup or wipe data and cache, feel free to make a backup. 14. No need to wipe data if you are coming from another ESE81 ROM. 15. Choose to reboot your phone. 16. Allow your phone to work the Pink-Life magic and reboot. Full support thread here including JRummy’s donate link. Try your hardest to support his continued work by donating.